Rotaville Rota Software is a new online webapp for managing workplace rotas, rosters, and employee schedules. 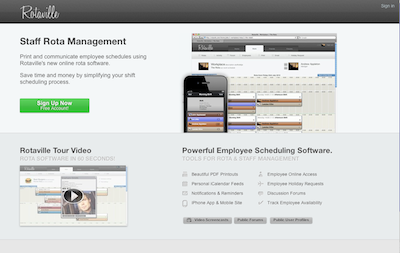 Staff and shifts can be easily scheduled by managers with an intuitive drag ‘n’ drop or keyboard driven real-time calendar interface. Printed PDF weekly rotas are generated PDFs with a unique one-page design. Mobile site access and iPhone App are available.